From the Hancock County Courthouse, go west on Hwy 22 for 0.2 mile. Turn right on Dixie Road. Go 1 mile. Turn left on Lakeshore Road (old Pumping Station Road) and proceed 7.8 miles to the "T" intersection with Warren's Chapel Road. (Note: this "T" intersection with Pumping Station/Lakeshore Road has Warren Chapel Road to the left and Harper Cemetery Road / Rives Rd. to the right). 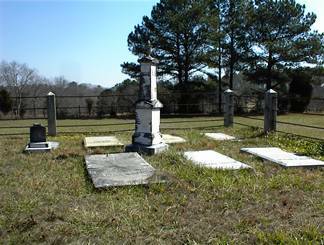 Turn right on old Harper Cemetery Road / Rives Rd. Go 0.7 mile. Turn right onto Rives Road (unmarked dirt road). Go 0.7 mile to the intersection of Rives Rd. and Fort Creek Rd. Continue on Rives Rd. which is the left road. Continue for another 0.8 mile. 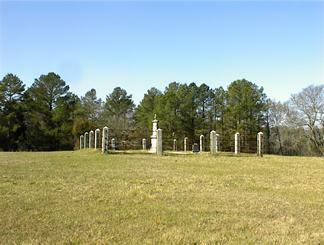 The cemetery is on your left, in a pasture, about 50 feet from the road. s/o Sydney Brown and Dora H. Rives. w/o Sydney B. Rives, Jr. No death date. s/o George S. and Mary E. Rives. "Dearest brother thou hast left us, here. Thy loss we deeply feel, But 'tis God that hath / Bereft us. He can all / Our sorrows heal." s/o George S. and Mary H. Rives. s/o George and Nancy Rives. "Although he sleeps / His memory doth live / And cheering comfort / To his mourners give." "Sweet babe, they spirit now hath rest, Thy sufferings now o'er."